Kia is spreading its feathers all over the auto industry to serve the needs of different customers and so with the Cadenza, they are preparing to step in the segment of large sedans. This is one of the best segments of the vehicle industry that is loved by families and executives to access comfort, ride quality and style all together. The Korean automaker Kia is trying to improve its product quality to become the part of some well-known brands and it is almost close to its goal as in different segments Kia introduced relatively strong and appealing models in the past few years. The 2014 Cadenza is a front wheel drive car which is built on the same platform of the Hyundai Azera. The new larger size sedan Cadenza is wider and longer than the Kia’s popular Optima that is offered in a well-equipped single trim level. The standard exterior features are automatic headlights with LED, power folding side-view mirrors, 18 inch alloy wheels, rain sensing wipers, a new exhaust system, lots of chrome accents on both sides of the doors, fog lights and standard LED tail lights. The larger sedan 2014 Cadenza will be offered in the Premium segment and so you can expect a high level of comfort and equipments inside the car. The combination of soft leather upholstery and chrome and wood accents are making the car very sophisticated. Standard interior features are 7 inch high resolution TFT display with a wide range of information and navigation system, keyless entry, tilt and telescoping steering wheel, heated front seat, ventilated and 10 way power driver seat, 4 way power passenger seat, 12-speaker Infinity sound system with CD player, USB, Bluetooth and Satellite radio. 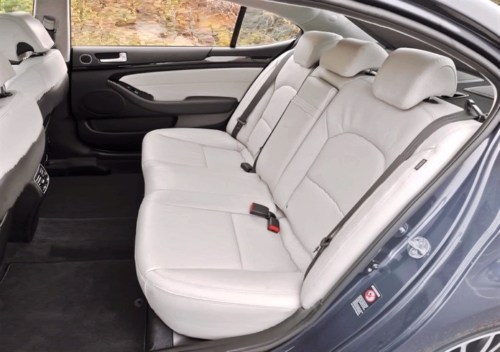 There optional packages are also available for the Kia’s larger sedan for extra comfort and convenience. A 3.3 liter V6 engine is offered for the new sedan produces 293 HP and 255 lb-ft of torque. The EPA rated fuel economy is 19 mpg city and 28 mpg highway and the car accelerates from 0-60 mph in 6.4 seconds. A six speed automatic transmission with manual shifting sends power to the front wheels. The 2014 Cadenza offers front and rear side and full length side curtain airbags, rearview camera, antilock disc brakes, rear park assist, traction and stability control as standard safety features. 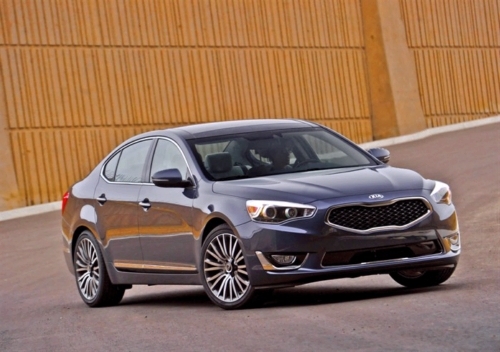 The Kia offers the 2014 Cadenza large sedan at a starting price of $35,100 and the car will hit the dealership in the second quarter of 2013. The all new Cadenza is very well built and well equipped but the car has to compete against some top notch and strong reputed competitors like Nissan Maxima, Toyota Avalon, the Chevrolet Impala, Lexus ES 350 and Hyundai Azera. The segment of large sedan is already loaded with lots of high end options but the introduction Kia’s new Cadenza make it difficult for the shopper to make a selection. The car is nicely built and well equipped and so it has the potential to attract shoppers and compete rivals with confidence.